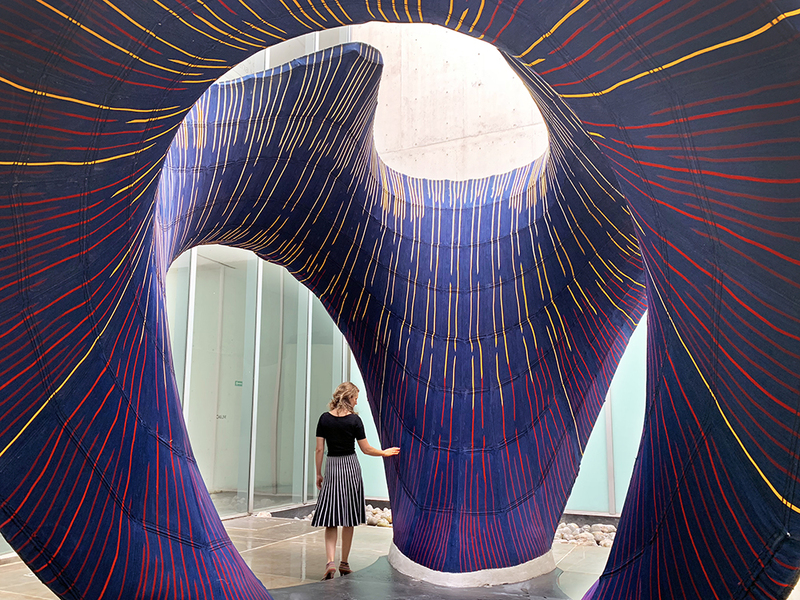 Located in Mexico City’s Museo Universitario Arte Contemporaneo, KnitCandela is a 13-foot-tall curved concrete shell formed with a 3-D-knitted framework. The sculptural project is a collaboration between Zaha Hadid Architects' Computation and Design Group (ZHCODE), ETH Zurich’s Block Research Group (BRG) led by Philippe Block and Tom Van Mele with PhD student Mariana Popescu, and Mexico’s Architecture Extrapolated who managed the on-site execution of the project. Named in homage to the concrete-bending designs of architect and structural engineer Félix Candela, the pavilion rests on three parabolic arches, with interior threadwork fashioned to resemble traditional garb found in the federal state of Jalisco, 340 miles northwest of the country’s capital. The pavilion is an outdoor feature of the museum's new exhibition, Design as Second Nature, featuring four decades of Zaha Hadid Architects' (ZHA) research into construction technology and design innovation. The project builds upon ETH Zurich's numerous recent forays into lightweight concrete structures based on curved geometries and digitally designed formwork. Currently, the university is leading KnitCrete, a partnership with the Swiss National Centre for Competence in Research in Digital Fabrication, to boost the technological expertise and production of hybrid and ultra-lightweight concrete structures. Past projects include an experimental concrete roof cast on 3-D printed sand formwork and an ultralight roof cap composed of a polymer textile and a network of steel cables. According to ETH Zurich, Block and Van Mele’s research group plugged a digitally generated pattern into an industrial knitting machine to produce the formwork. Over the course of 36 hours, the flat-bedded mechanism knitted over 200 miles of polyester yarn into four 3-D double-layered strips. To suspend the canopy, the upper layer of the textile bears a series of sleeves for the insertion of supporting cables. 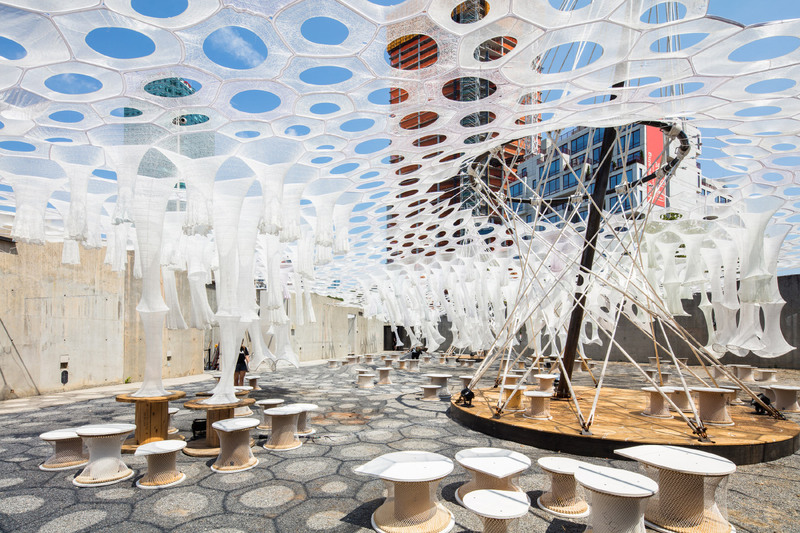 Additionally, the woven formwork integrated 1,000 inflatable modeling balloons that were transformed into waffle shell-like voids following the initial coating of concrete. The entire woven assembly, weighing a meager 55 pounds, was transported to the location via two suitcases stowed as normal checked baggage. Once onsite, the double-layered textile was tensioned between a steel-and-wood boundary frame and subjected to an initial millimeters-thick concrete coating. After hardening and the creation of a lightweight mold, the team poured five tons of fiber-reinforced concrete over the original 120-pound polyester-and-cable framework. The pavilion will remain in place until March 3, 2019. We’ve always known that Rem Koolhaas has a special relationship with textiles and those who make them. But watch out Petra Blaisse, someone else may be hoping to knit his way into Rem’s heart. 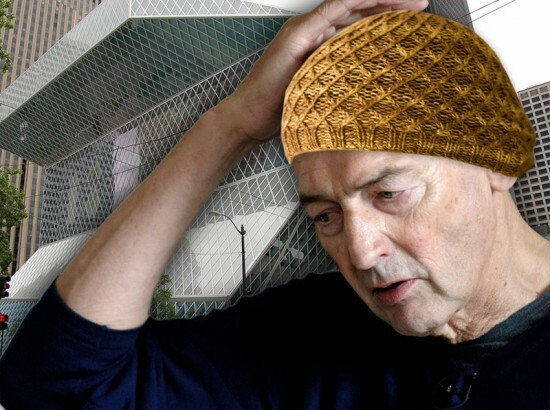 According to the blog Knitting Daily, artist Jared Flood has created the wool “Koolhaas Hat,” a toboggan whose diamond-shaped pattern is inspired by the facade of OMA’s Seattle Public Library. We hope Flood will send a sample directly to Rotterdam. Watching a recent video of Rem accepting the annual Charles Jencks Award at RIBA in London, the formidable noggin looked particularly windswept.